The top-selling type of Cimarron Sports batting cage frame, Cimarron 55 ft L x 15.5 ft W x 12 ft H commercial batting cage frames are designed to stand up to the wind and elements and are a great solution for people looking for a permanent batting cage structure. Please Note: This kit does not include a net. 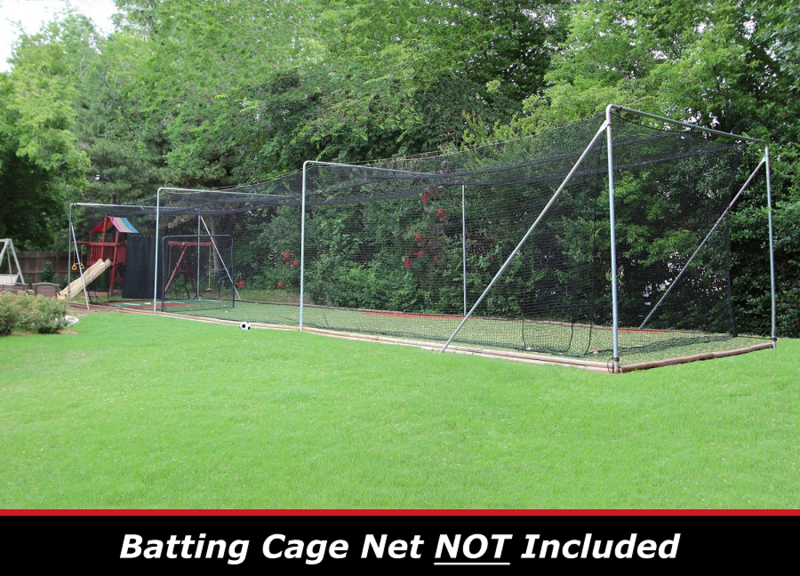 Batting cage nets can be purchased separately. Q: Can you secure the posts into concrete in the ground? how sturdy are they ? A: Not only can you secure them to the ground with cement, you HAVE TO cement them into the ground. That is what makes them commercial cages, which are the sturdiest of all batting cages. A big gust of wind isn't taking something cemented to the ground anywhere. For more insight, click the Owner's Manual tab on the page and you will see a link to the complete assembly instructions. THE CIMARRON GUARANTEE: Cimarron Sports guarantees 100% satisfaction with your 55' x 15.5' x 12' Batting Cage Frame. Products may be returned for a refund within 31 days of the date the product was shipped to you, when returned in accordance with the Cimarron Sports policies outlined in the Shipping & Returns section of this website. Click here to download an easy to read, printable PDF of the Cimarron 55x15.5x12 Complete Commercial Batting Cage Frame Owner's Manual.